I will be at the Holocaust Center of Pittsburgh this Sunday, February 11th, to celebrate the opening of The Art of Resistance — original comic pages from the first two volumes of Chutz-Pow, as well as the release of the all-new Chutz-Pow Volume 3, which I worked on. Chutz-Pow: Superheroes of the Holocaust is a comic book series produced right here in Pittsburgh, in conjunction with the Holocaust Center of Pittsburgh. These books tell the stories of survivors of the Holocaust. The third and latest volume focuses on survivors who were just children when World War 2 changed their lives. A bunch of my cartoonist friends have work in this volume (Mark Zingarelli, Howard Bender, Marcel Walker, Wayne Wise, Loran Skinkis) and most of them will be there at the opening. Tickets at the door are a very reasonable $5. Here’s the rest of the details on the event. Stop by to see the artwork from the first two volumes, pick up copies of all three books, and talk to some of the writers and illustrators who worked on all three books. I rarely leave the house without a sketchbook and this beat-up, old, faux-suede-covered pencil case. I’d have preferred black, but it was a gift so who am I to complain? Anyway, at home I’ve got shelves loaded with art supplies (and, of course, my trusty computer). But what if I have to go outside?! The horror! Well, this case has everything I need if I want to make some art on the fly. 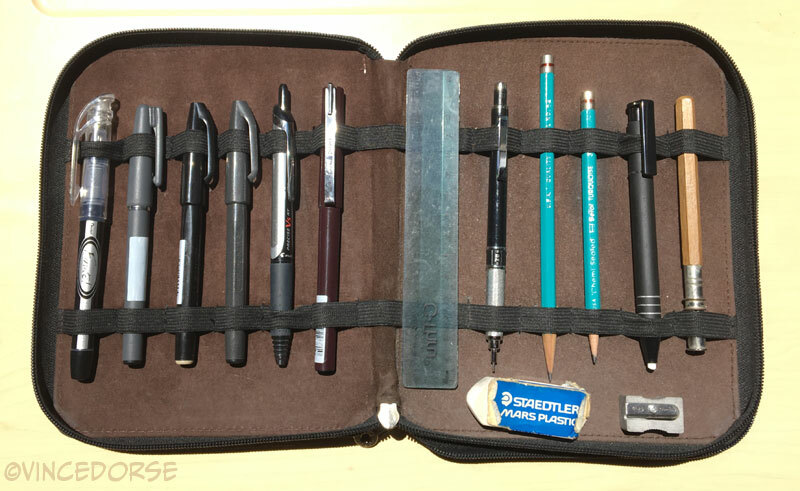 People have asked before what tools I use to draw, so I figured I’d lay it out here in this exhaustive post that is for drawing nerds only. The rest of you will fall asleep. So. What’s in the case? I’ll run down most of the things in here on the off chance you wanna try ’em out for yourselves. I’ve burned through a lot of different tools over the years, and this is my current set-up because they get the job done. Maybe there’s better stuff out there – and if you’ve found different favorites, feel free to let me know – but so far these are my go-to tools. Let’s get to it! We’re starting off slow. This Pentel Finito X-Tra Fine was given to me by a Pentel rep as part of a sample package and, though I don’t use it often, it’s a great pen with a fine-fine tip that’s nice for detail work in a pinch. I also like to sign artwork with it because it’s just a nice pen in general. Very precise, but no give or variation in stroke. Perfectly workable all-purpose fine-tip pen, though. And not expensive. The first two Bigfoots were done with the felt tip sign pens. They’re klunky. Good to have if you don’t want variation in your line, or if you’re filling in small areas with black. But that third Bigfoot that I sketched with the brush-tip pen? You can tell the line just feels more natural on the paper. You get a pretty broad range of thick-and-thin considering how inexpensive this pen is. You can buy the 3-pack, but honestly, that brush-tip pen is the only one I really use. When these dry out I’ll likely just replace that one. Look, sometimes you just need to write something. Not draw. Write. These are just pens I use to write/sign with. The Pilot Precise V5 (extra-fine) is a great everyday pen. So is its brother, the Pilot Precise V7 (fine). They both have these teeny-tiny needle points that are great if you like to write small. If you’re one of those people (like me) that’s always looking for “the perfect pen” then give these Pilots a try. That other pen? I have no idea what it is. It was part of my sample pack from Pentel. Take a look at the odd point, though. What’s going on with that point? It’s like a weird spear-head with a nib threaded through the center. I have no idea what pen this is (the markings have all worn off), and I only keep it around because it’s a mystery I’d like to solve. So if you know (and if you understand what that weird tip is all about) leave me a message in the comments. I rarely use it and I’ll probably ditch it soon unless I can figure out what the heck it’s for. Nothing to see here, folks. 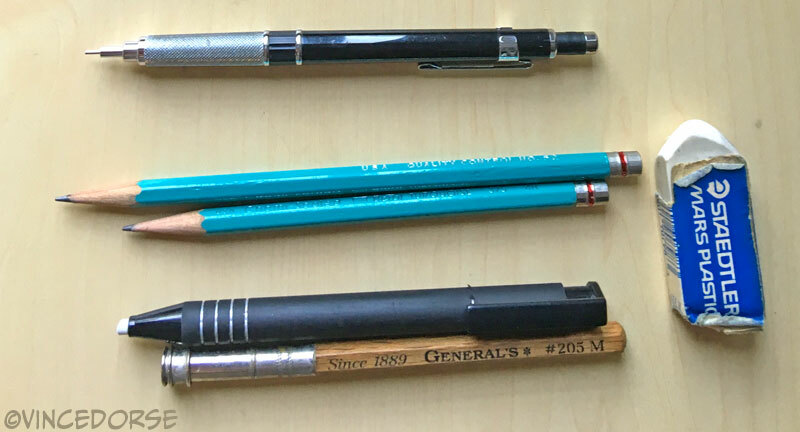 Just a mechanical pencil I use sometimes (with a darker 2B lead), some regular pencils (4H, very light) and erasers. There’s an old-fashioned pencil holder/extender because I’m too cheap to throw away short pencil nubs. I also keep a 6-inch ruler and a small pencil sharpener handy. Lots of different folks have lots of different solutions for white ink pens. I’ve tried a few different brands, and this Gelly Roll White Gel Pen by Sakura has proved to be the most effective and reliable. It lays down a smooth, opaque line, and unlike some others I’ve tried, the gel doesn’t dry out too quickly. I’ve thrown away white pens half-unused because the ink dried in the barrel. So far, the Gelly Roll has stayed fluid the longest. And they’re inexpensive. If you’ve read through my recent Bigfoot/Star Wars post, you know I recently discovered these Pigma Brush Pens and that I love them. They come in three sizes (fine, medium, bold), have a lot of bounce to the tips, and lay down a very nice variable-width line. The ink is waterproof and dries quickly. No refills, by the way. Like most of the pens in my case, these are disposable. Here’s a look at their felt nibs. 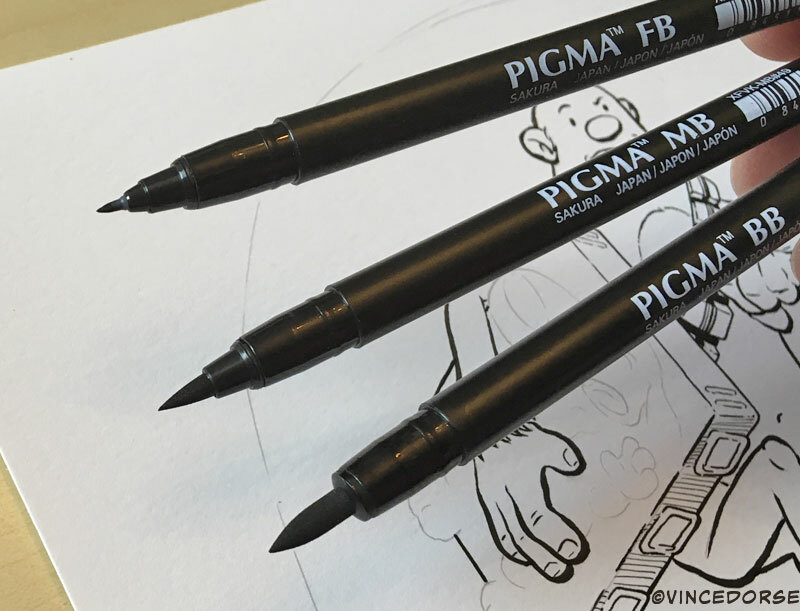 And if you’re looking for a bold, consistent line, the Pigma Graphic Pens are great.The #1 brush is your basic, bullet-tipped felt pen, while the #2 pen has a broad, chisel tip. Great for lettering too! And I don’t know what to call this version of the Pigma Brush Pen to distinguish it from the other Pigma Brush Pens above, but the felt nib on this version is long and wiggly. Not quite as bouncy as the three Pigma Brush Pens above, so my control with this isn’t as great, but it lays down a nice thick-thin line. 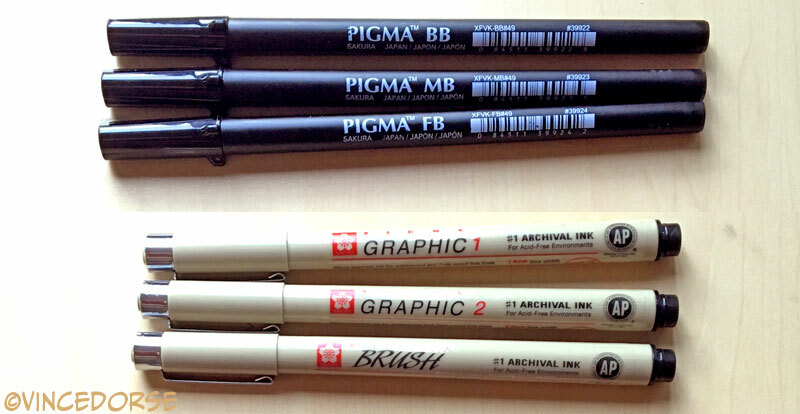 This brush pen (and the #1 & #2 graphic pens) boast archival ink. You can see this nib is getting a little chewed up. I’ve had it a long time. And since finding those other Pigma Brush Pens, this one might work its way out of rotation. But, in a pinch, it’s a nice brush pen if you can’t lay your hands on anything else. I use the PITT Artist Pens from Faber-Castell a lot. They’re great technical pens that lay down a consistent line. I mean, if you fiddle with your hand pressure a bit you can get a teeny-tiny bit of variation in the line, but mostly these are great for solid, consistent lines. There are different sets available, but the one I always pick up has four sizes: Medium, Fine, Super-Fine, and Extra-Super-Fine. Kooky size names, but great pens. 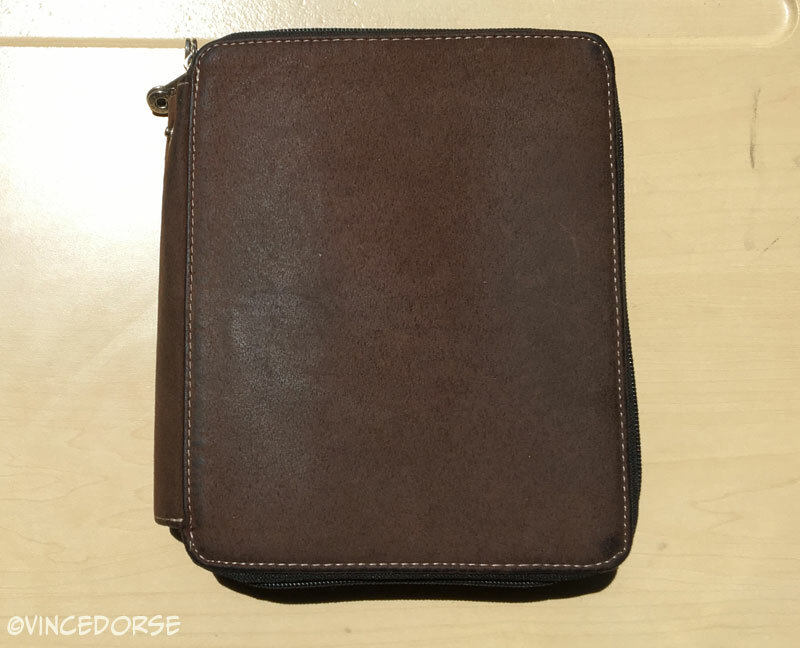 Now, the ink in here is said to be “water-resistant” and “permanent”….which may not be quite as good as “waterproof and archival” but the ink comes out so smooth and solid that I can’t give them up. 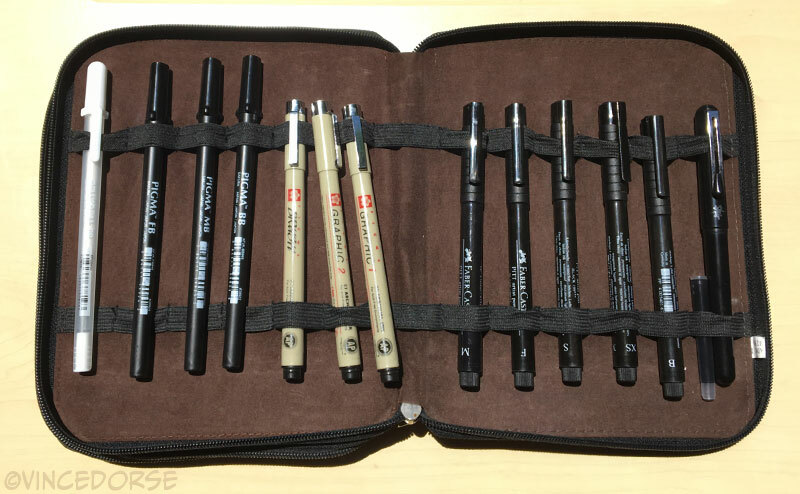 Somewhere in my art shelves I have a set of Sakura Pigma Technical Pens…maybe I’ll dig those out and see if they’re waterproof and archival. I may be switching up if that’s the case. But aside from that, I really love these pens. And their brush pen (above) is also a nice felt-nib brush pen. Good responsive tip. One drawback I’ve found with this brush pen – and maybe it’s just me – these tips seem to lose their points quicker than any other brush pen I’ve used. They mush down and get a little ratty. Maybe I’m pressing too hard? Maybe when I’m out the cat’s messing around with my brushes? I don’t know. But that’s been my experience. Finally, probably my favorite (and a lot of people’s favorite) brush pen, the Pentel Pocket Brush Pen. Yes, the Sakura Pigma’s are great and I love ’em. But this pen is the closest I’ve come to an actual brush feel without digging out my Windsor-Newton and bottle of India Ink. The tip isn’t felt. The tip is actually made up of synthetic bristles that fill with ink once you snap in the ink cartridge. You can lay down a line that has amazing dynamics – from a razor sharp fine line to a really thick, heavy line. It’s a very expressive brush pen and it may take some practice to get used to how live the tip feels. Lots of play in those bristles. But if you want something close to a brush, you should give it a try. As I mentioned above, the Pentel Pocket Brush Pen is refillable. And they sell the refill cartridges in these handy six-packs. My old news & process blog over at google/blogger had become infested with spam and unwanted popups. So I killed it. Killed it dead. But I need to have a place for all that stuff so this samples blog will eventually be that place. Sorry to anyone who was still actively following this samples blog. To be honest, I’ve been so busy working on Untold Tales of Bigfoot that this blog hasn’t seen an update in a while. The good news is that I’ll still be posting artwork, but now it’ll be accompanied by text intended to delight and amuse. Or not.